Salesmanship isn't what it used to be. Consumers today are more distrustful of sales people than every before. Fast-talking, slick sales people using outdated manipulation techniques are being replaced by "service professionals" who listen more than they talk. Consumers have made their preference clear: They want to be served, not sold. In the old days, the Sales Cycle began with the first interaction between buyer and seller. But today, with the abundance of information available to consumers online, buyers are now nearly 60% along the path to a purchase decision before they ever meet a salesperson. Times have changed. And as consumers become more informed and more educated, the balance of power will continue to shift in favor of the buyer. The question is, as a salesperson and a marketer, are you adapting to these changes in consumer behavior? I believe it all begins with re-framing the way you approach sales. "You know you are running a modern sales team when selling feels more like the relationship between a doctor and a patient and less like a relationship between a salesperson and a prospect. When you go in to see your doctor and she asks you about your symptoms, you tell her the truth. You trust that she can diagnose your problem and prescribe the right medication. When she says, "This is what you have. Take these pills," you don’t say, “Let me think about it” or “Can I get 20 percent off?” You take the medication. In order for this approach to work, you must position yourself (and/or your company) as an Authority Figure. Authority is one of Cialdini's 6 Principles of Persuasion. 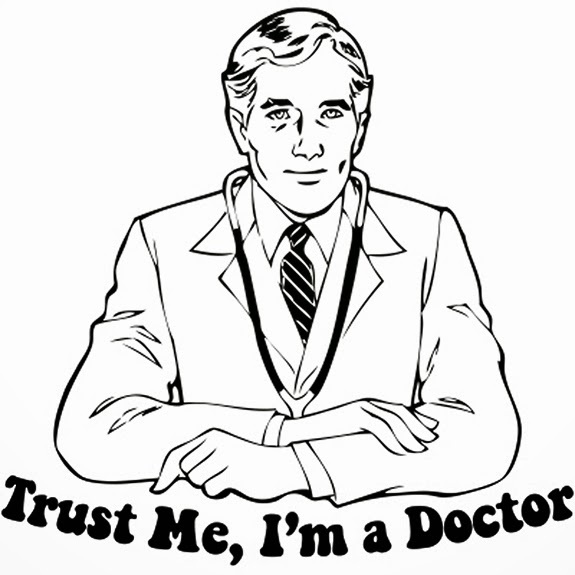 People follow a doctor's advice because he has established himself as an authority on the subject. An expert. A trusted advisor. How do you establish yourself as an Authority? Write: The root of the word Authority is Author. We view authors as authorities on the subjects they write about. Blogging, YouTube videos, white papers, writing articles for magazines, etc. are all great ways to demonstrate your knowledge of a subject. And position yourself as a thought leader. The go-to expert in your industry. And Social Media gives you a platform - and an amplified voice - to spread your message like never before. Testimonials: In terms of marketing, nothing in the world is more powerful than a third-party endorsement. The more endorsements you earn, the more your Authority grows. Furthermore, endorsements provide Social Proof (another one of Cialdini's 6 Principles of Persuasion). People like safety in numbers. If everyone is doing it, then it must be okay. Now more than ever, consumers are turning to the Internet to read reviews posted by others before making a decision [*]. The more Social Proof you have backing your brand, the more your Authority grows.